The Grillworks Langelier. Born where metal meets chef and shaped by live-fire arts spanning the globe, she is our ultimate statement for the home or the perfect array of features in a footprint tailored to a small restaurant space. This new model line bridges a live-fire gap that we believe need no longer exist. The space between our 35-years-running family models, designed for day in, day out, show-stopping grill parties and our Infierno professional grills; home-fired souls wrapped in world-beating firepower. The Langelier comes outfitted with twin gear-driven lift systems, just like the Infierno X and EXO models, scaled appropriately for a more svelte footprint and each carrying two hot-swappable cooking surfaces. 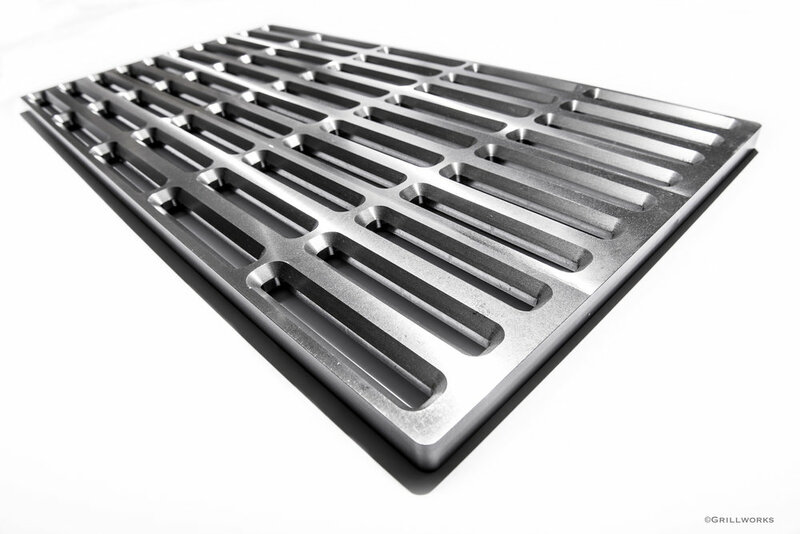 This means you can grill on our signature South American juice-catching V-Channels (shown), or hex bar, or solid plancha, or fine mesh; in any combination (see below). The Blanco Oven Cap crowning the grill catches wood heat and smoke to give you a baking and roasting area, or (with a low fire) a slow smoke chamber. Side tables (not shown) can be added on each side for cool prep or chef-cocktail zones. Built entirely of 304 stainless steel tube-over-plate and lined in easily replaceable fire brick, she can stand out in the elements all year long and need only a rub down to return to her brushed sheen. AVAILABLE NOW in 54 or 42” wide sizes. The 54 is built in Infierno-scale 2” tube and the 42 is in more svelte Asador-scale 1.5” frame. Lead times are 3-4 months from order, depending on our build queue. Shown in 54 with optional Blanco Oven Cap. Call 855-434-3473 or email orders@grillworks.com for details and pricing. Patents pending.